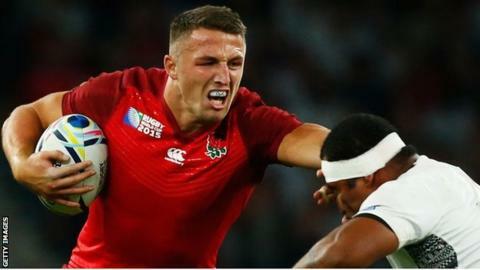 Wales will set out to "smash" rookie centre Sam Burgess - just like the rest of his England team, says coach Warren Gatland. The two sides meet in Saturday's World Cup Pool A match at Twickenham, kick-off 20:00 BST. League convert Burgess, 26, has played only 112 minutes of international rugby union and will line up opposite Jamie Roberts, who has 70 Wales caps. "We won't be trying to single out Sam Burgess at all," said Gatland. "We will be going out there to smash him like everyone else," he added. Bath's Burgess bowed out of the 13-man code in 2014's NRL Grand Final. He put in a man-of-the-match performance when South Sydney Rabbitohs won their first title in 43 years. And Gatland believes that sort of experience will serve Burgess well. "He's got inexperience at rugby union, but not at big occasions," said the Wales coach. "We're not rubbing our hands together about one player thinking there's a weakness there - that is not the way we look at it. "When you underestimate a player, it comes back to bite you." Wales' second-row Bradley Davies, who plays his club rugby for Wasps, says he is looking forward to facing Burgess, having been a fan of the centre in the 13-man code. "I watched him when he played rugby league and he's a great athlete," he said. "I think he's very similar to Jamie Roberts in the way they play. "It's going to be fantastic to see them running at each other and hopefully I'll get a chance to run at him before he can run at me. "You want to play against the best. He's a world-class rugby league player and he's transferred to rugby union now and hopefully we can make it an uncomfortable day for him and we can win." England coach Stuart Lancaster says Burgess's selection - along with Saracens' Brad Barritt in midfield - is designed to deny Wales front-foot ball and momentum, but thinks that the former Bradford Bulls man also offers attacking threat. "Sam's a good and powerful defender. But also I think he offers us a threat in attack. We don't always have to use the threat that he is. Sometimes you can bypass him. "The game will be judged a success if we win. If we lose I will be questioned. Clearly my selection heightens it."